In this review I'm taking a look at the Noctua NH-U12F processor cooler. 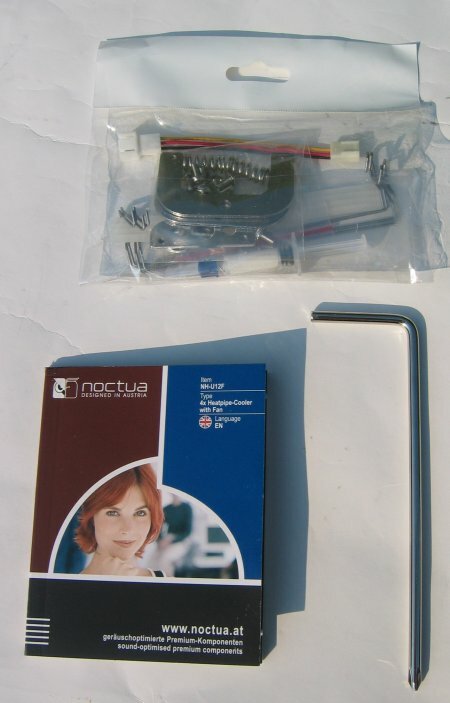 Noctua is an Austrian company which specialises in silent cooling gear for PCs. Their NH-U12F cooler features a big and heavy HSF which uses a very silent 120mm fan to provide nearly noiseless cooling. The NH-U12F is compatible with the latest sockets from Intel and AMD, it supports Socket LGA775, Socket 754/939/940 and Socket AM2. Earlier this month I already reviewed Noctua's 80mm and 120mm fans and I was amazed how silent they were. The exact same 120mm fan is included in the NH-U12F bundle so even before I unpacked the product I already knew this would be a pretty quiet cooling solution. But being quiet isn't enough to be a good CPU cooler, the cooling performance also matters greatly. 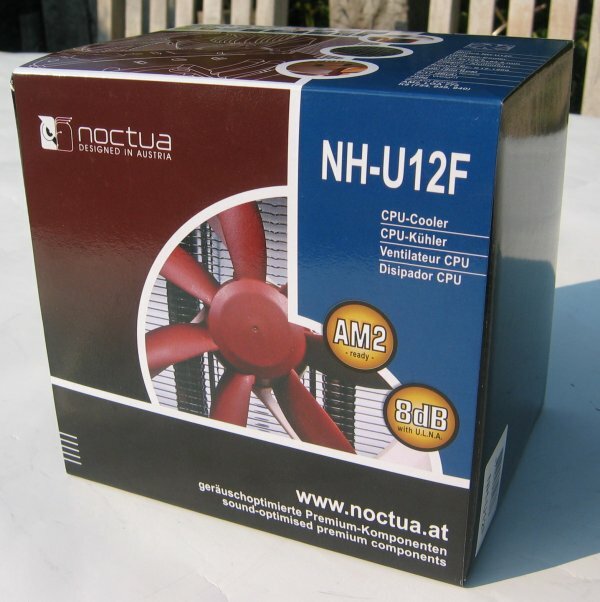 Read on to find out more about the Noctua NH-U12F's cooling performance. The Noctua NH-U12F HSF ships in this cardboard box. Compared to boxes from other heatsinks this one looks pretty plain and it doesn't really give a good look at how the cooler looks like. 4 dual u-shaped heatpipes for optimal heat absorption. 38 aluminum cooling fins which provide a total surface area of more than 5000cm³ to dissipate the heat. Screwless fan mounting system. Also includes anti-vibration strips for extra quietness. SecuFirm mounting system - guarantees optimal contact pressure and maximum security thanks to the use of a backplate and spring-loaded screws. As a result, the SecuFirm mounting system makes it possible to safely transport the assembled system without any risk even though the cooler exceeds the 450g weight specification established by Intel and AMD. Perfect for LAN gamers! When you open the box the first thing you see is this 120mm fan. 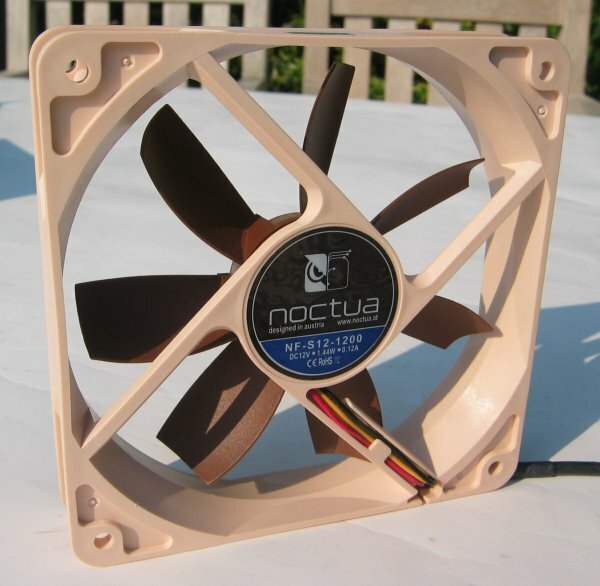 I've already reviewed this fan a couple of weeks ago so if you want to learn more about it I suggest you read my Noctua NF-SF12 fan review :-). On the photo above you can see the manual, a bag with all kinds of tools and one of the mounting tools. The manual is very detailed and contains all the installation steps to install the cooler. The bag which you can see on the photo includes the following items: 2 anti-vibration strips, a tube of thermal paste, 2 pressure springs, some screws, 2 pair of fastening brackets, the Ultra-Low-Noise adapter and 4 steel clips to mount the fan. Although only one fan is included, Noctua included an extra pair of fan clips so you can add an additional 120mm fan to the heatsink. This allows you to create a "push-pull" fan configuration. 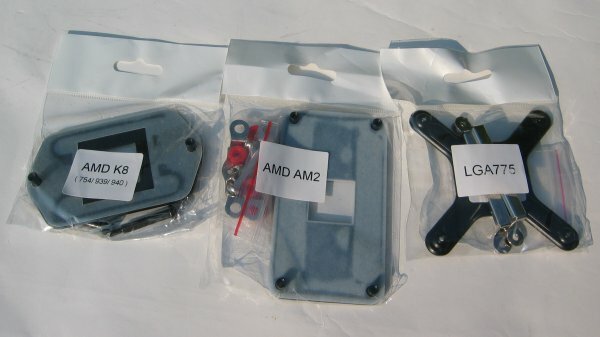 And this photo shows all the mounting hardware for the AMD K8 (754/939/940), AMD AM2 and Intel LGA775 sockets. Each plastic bag contains a backplate, four washers, stepped spring screws and the mounting bars. Head over to the next page for a look at the heatsink.